Many desktop systems rely on NetworkManager, but this isn't the only way to get a Linux system online. Arch Linux comes with netctl—a systemd-native way of managing physical network connections. # Open a menu to find Wi-Fi connections. Use wifi-menu to set up a profile. Running it will bring a CLI menu of nearby Wi-Fi networks. The wifi-menu is a utility to create netctl profiles. 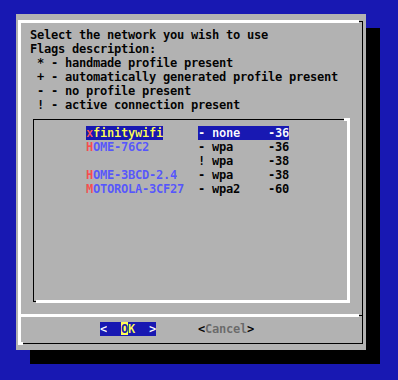 After selecting a network in wifi-menu, a profile will be created in /etc/netctl. After creating a profile, wifi-menu will automatically try to connect to it. Only do this once per Wi-Fi network! After the profile's been created, you can connect to it without wifi-menu. After creating a profile, you can connect to it using netctl switch-to <name>. The name is the name you provided in wifi-menu. Use netctl list to show what profiles have been created before. Check for the status using iw dev—this will list of your physical devices. This should show you what SSID you're connected to, if any. Use netctl enable to "enable" a profile. This creates and enables a systemd service, which is invoked on every bootup. For the most part, I find NetworkManager to be a preferrable choice over netctl for desktop systems. It works, it integrates with GNOME and Plasma, it has a lot of user interfaces (nmtui being my favorite—a CLI version! ), has support for OpenVPN, and many more. With that said, I've been trying to use netctl instead lately for one silly reason: it seems to wake up faster from sleep! This only happens on my MacBook Air though, I've found NetworkManager to connect pretty fast in other systems. There's also something to be said about going with a slimmer setup. Netctl seems a little closer to the metal than NetworkManager, and comes built-in as part of the base package in Arch Linux. You have just read Managing Wi-Fi connections in Arch Linux with netctl, written on April 11, 2019. This is Today I Learned, a collection of random tidbits I've learned through my day-to-day web development work. I'm Rico Sta. Cruz, @rstacruz on GitHub (and Twitter! ).